Swedish drummer Magnus Öström and bassist Dan Berglund had a magnificent run with pianist Esbjörn Svensson in the trio e.s.t. until Svensson’s tragic death in a diving accident in 2008. 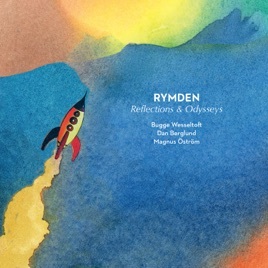 In the new trio Rymden (Swedish for “outer space”), they return with Norwegian pianist/keyboardist Bugge Wesseltoft, whose like-minded New Conception of Jazz project changed the conversation about jazz as a traditional vs. radical art form. On acoustic piano and Fender Rhodes, Wesseltoft calls forth a roomy, atmospheric family of sounds above Öström and Berglund’s energized and intricate beats. The blend of Rhodes with Berglund’s acoustic bass is rich, especially when sonic abstraction fades away and the trio works out with Chick Corea-esque speed and intricacy on a piece like “Pitter-Patter.” When piano comes to the fore, as on “The Lugubrious Youth of Lucky Luke” and the tranquil finale, “Homegrown,” a plaintive lyricism prevails. Yet the grainy, kalimba-like textures at the start of “Bergen” and the snarling black-metal riffs of “Råk” extend the trio’s expressive range even further.